• Week 1: Family - Disaster preparedness starts with personal preparedness for you and your family. Each family has unique needs that must be accounted for in their preparedness plans. Children, older adults, and individuals with medical conditions and physical disabilities all have unique needs during and after disasters. We will talk about incorporating unique needs into emergency preparedness to ensure that the needs of the entire family are included in preparedness plans. • Week 2: Neighborhood - Those in closest proximity to you during an emergency are most likely to be the first to offer help. Messages will encourage individuals to meet neighbors and develop emergency preparedness plans with those who live around them--taking into account individuals' unique needs. The focus will be community resilience and preparedness on a neighborhood and community level. • Week 3: Workplace and School - Whether you are at work or home or your child is in school it is important for individuals to know specific threats and hazards in their area, emergency signals, evacuation routes, and locations of shelters in their community. 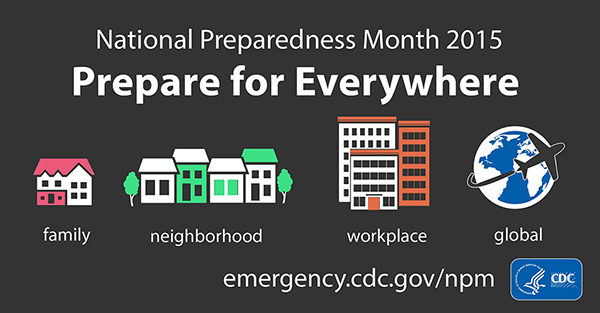 We will encourage people to maintain an emergency preparedness kit at work and discuss disaster plans with their co-workers. • Week 4: Global - With the ease of air travel, infectious diseases can spread rapidly. Global health security is an ongoing priority that requires individuals to be aware of their health and safety when they are travelling abroad. Messages will focus on preparing for public health threats before, during, and after travel to protect everyone's health.